As I explained in my guide to installing Mavericks, one of the requirements for installing OS X 10.9 is that you already have at least Snow Leopard (Mac OS X 10.6) installed. 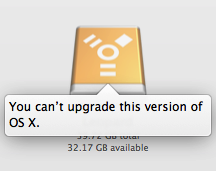 (Specifically, Mavericks requires OS X 10.6.8 or later.) The main practical reason for this requirement is that Mavericks is available only via the Mac App Store, and the Mac App Store debuted in Mac OS X 10.6—in other words, you need Snow Leopard or later just to be able to purchase and download Mountain Lion. But once you’ve got your copy of Mavericks, can you install it onto a Mac or an external drive containing Leopard (Mac OS X 10.5)? The software license you agree to when you install Mavericks states that you can “download, install, use and run for personal, non-commercial use, one (1) copy of [the OS] directly on each Apple-branded computer running OS X Mountain Lion, OS X Lion or OS X Snow Leopard...that you own or control." In other words, if your Mac shipped with Mountain Lion, Lion, or Snow Leopard, you can install Mavericks. If your Mac shipped with Leopard or Tiger (Mac OS X 10.4), but you later purchased and installed Snow Leopard, Lion, or Mountain Lion, you can install Mavericks. If your Mac doesn’t at least have Snow Leopard installed, you can’t install Mavericks. That seems pretty clear. But what if, for example, you’ve got a family-pack license for Snow Leopard, and you’ve got a Mac that shipped with Leopard but that’s never been upgraded to Snow Leopard, Lion, or Mountain Lion? The Mavericks license agreements say that even if that Mac is compatible, you can’t upgrade to 10.9 until you first install at least Snow Leopard. This is just one scenario—I can think of a number of situations in which you might have Leopard on a Mac or an external drive, along with a valid license for Snow Leopard, and you'd rather not take the interim step of installing Snow Leopard just to upgrade to Mavericks. Having performed this two-step upgrade many times while researching our various Mavericks-installation articles (and the past two years while writing our upgrade guides for Lion and Mountain Lion), I can tell you that it’s a real hassle. But lets take a step back. While the letter of the law says that you need to install at least Snow Leopard before installing Mavericks, the spirit of the law seems to be that a particular Leopard-equipped Mac just needs a license for Snow Leopard, Lion, or Mountain Lion before you can upgrade it. In other words, in our view, you should be well within your rights to install Mavericks on any of your computers for which you have a valid, current Snow Leopard, Lion, or Mountain license—even if you don't actually install Snow Leopard first. So then the question becomes whether there are any technical reasons you can’t install Mavericks over Leopard. The Mavericks installer refuses to install onto a drive running Leopard (OS X 10.5). In my testing with many Macs, the Mavericks installer, like the Mountain Lion and Lion installers before it, refuses to install onto a drive containing Leopard; in fact, it refuses to install on any drive running a version of Mac OS X below 10.6.8, just as its official system requirements claim. The Mavericks installer will, however, install onto a blank drive, so Mavericks clearly doesn’t need any of Snow Leopard's files or settings. You may be thinking, “If it will install onto a blank drive, I’ll just copy the installer to my Leopard-equipped Mac, connect an empty drive, install the new OS there, and then use Setup/Migration Assistant to move my files over.” Alas, while the Mavericks installer will let you install the OS onto a blank drive, the installer itself must be run from within Snow Leopard, Lion, Mountain Lion, or Mavericks. So how can you install Mountain Lion over Leopard? There are three ways: the official way, the brute-force method, and the quick-but-techie way. Whichever method you choose, you should—as with any OS installation—be sure to have an up-to-date, tested backup of your drive before you begin. Note that there are actually two Mavericks-compatible Macs—the Mid 2007 iMac and the Mid/Late 2007 MacBook Pro—that shipped with Tiger [Mac OS X 10.4]. If you’ve got one of these Macs, still running Tiger, and you’re determined to upgrade it to Mavericks, the first two methods below (“The official way” and “The brute-force method”) will work; the third method (“The quick-but-techie way”) will not. As I explained above, Apple’s official policy is that if you want to install Mavericks over Leopard—assuming, of course, the Mac in question meets the system requirements—you must first install Snow Leopard, purchasing it for $20 if necessary, and then install Mavericks. This approach works fine, it’s fairly easy to do (if a bit time-consuming), and it gets the Apple seal of approval. What if you don’t want to install Snow Leopard first, or if you don’t have your Snow Leopard disc handy? I’m not being coy here—perhaps you’ve misplaced the disc, or maybe you’re on the road and you’ve got your Mac’s original (Leopard) disc with you as an emergency boot disc, but you don't have your Snow Leopard upgrade disc. As I mentioned above, the Mavericks installer will let you install onto a bare drive as long as the installer itself is run under Snow Leopard, Lion, Mountain Lion, or Mavericks. This means that as long as you have a good backup; a 6GB-or-larger thumb drive or external drive; and either an already-downloaded copy of the Mavericks installer or access to a Mac running Snow Leopard, Lion, Mountain Lion, or Mavericks, you can perform a bit of installer razzle-dazzle. Make sure you have an up-to-date backup—either a Time Machine backup or a clone backup using a utility such as SuperDuper or Carbon Copy Cloner—of your Leopard Mac’s drive. (For this purpose, I recommend a clone.) Be sure to test this backup to verify that it has your latest data: In the case of a Time Machine backup, try restoring some important data from the backup; in the case of a clone backup, boot from the clone to make sure it boots and that it contains all your data. Create a bootable install drive using the instructions for creating a bootable Mavericks install drive. Boot your Leopard Mac from that new install drive. When you do so, you see the initial Install OS X screen. From the Utilities menu at the top of the screen, choose Disk Utility. Use Disk Utility to erase your Leopard Mac’s internal drive. To do so, select that drive on the left, click Erase on the right, choose Mac OS X Extended (Journaled) from the Format pop-up menu, and click Erase. Warning: This step erases all the data on your Mac’s drive, which is why you needed that backup! When the erase procedure is finished, quit Disk Utility to get back to the Install OS X screen. Click Continue to install Mavericks on your Mac’s internal drive. After your Mac restarts, installation finishes, and you proceed through the setup process, watch for the Transfer Information To This Mac screen. You’ll choose either the option to transfer data from a Time Machine backup or to transfer data from another startup drive (such as a bootable clone backup), depending your backup type. This step transfers all your files from your backup to your new installation of Mavericks. When the transfer process is finished, you’ll be able to log in to Mavericks with all your accounts and data intact. If you’re comfortable diving into the OS and editing a .plist file, this is the fastest way to install Mavericks over Leopard, although, as with the previous method, you’ll need to be able to boot from a Snow Leopard, Lion, Mountain Lion, or Mavericks drive to actually run the installer. As I mentioned above, the Mavericks installer refuses to install over Leopard Mac. But how does the installer know your drive contains Leopard, and not Snow Leopard or later? It turns out that the installer simply checks a particular file—/System/Library/CoreServices/SystemVersion.plist—on the destination disk to check the version of OS X currently installed on that disk. On your Leopard-equipped Mac (or, if you’re trying to update an external hard drive—including a Mac in Target Disk Mode—that has Leopard installed, on that drive), navigate to /System/Library/CoreServices. Using a text editor that lets you enter an admin-user name and password to edit system-level files—such as the non-Mac App Store version of TextWrangler—open the file called SystemVersion.plist. Change that number to 10.6.8, save the file (providing your admin-level username and password when prompted). If you modified an external drive, and the Mac you're working on is already booted into Snow Leopard or later, you can launch the Mavericks installer immediately. If you modified your Mac's startup drive, you'll need to boot your Mac from a drive running Snow Leopard or later that also contains the OS X installer. (If you've created a bootable Mavericks install drive, just boot your Mac from that, and when the Install OS X screen appears, continue until you can choose your Leopard drive as the install destination.) Another approach would be to boot your Leopard Mac from an external drive containing Snow Leopard or later, and then run the installer from there. Yet another option, if you've got two Macs with FireWire or Thunderbolt, is to boot the Leopard Mac into Target Disk Mode and connect it to your Snow Leopard or later Mac, and then run the installer. If you aren't using a bootable Mavericks installer (in other words, if you're booted from a standard drive running Snow Leopard or later), one additional tip: As explained in my main article on installing Mavericks, when you get to the installer screen showing your internal drive, you need to click the Show All Disks button to show your Leopard drive, and then select that drive as the install destination. Whichever approach you take, when you’re done, you’ll have Mavericks on your previously Leopard Mac. Should you do a "clean install" of Mavericks?